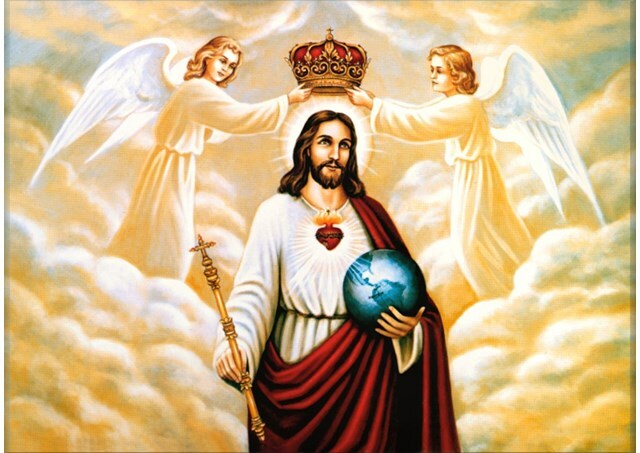 Today we celebrate the Solemnity of Christ the King of the Universe. What a glorious day! Jesus Christ is King of all (1 Corinthians 15:20-26,28). The king of the universe; of all that is seen and unseen. The very word "Christ" means "anointed one, or king." The Solemnity of Christ the King of the Universe was instituted by Pope Pius XI in 1925 in his encyclical Quas Primas. The day was originally called the Solemnity of Our Lord Jesus Christ the King. In 1969, Blessed Pope Paul VI revised the title as "Our Lord Christ King of the Universe" in his motu proprio Mysterii Paschalis. Priests in the Catholic Church wear white or golden color vestments to show the glory and joy behind the celebration. Other Christians bodies such as the Protestants or the Orthodox have even adopted the day and have their own ways of celebrating it. This day always falls on a Sunday and is the last Sunday of the Liturgical calendar. The Sunday that follows is the First Sunday of Advent which begins a new liturgical year. This is a reminder to us that Christ is the Alpha and the Omega; the beginning and the end (Revelation 21:6). Jesus ends the liturgical year and begins a new one. He is eternal and the center of the prayer life of the Church. He was at the beginning of time and will judge all at the end of it. The first reading reminds us that God looks out for us. He tends His sheep. God does not abandon us. God is our shepherd who guides us and is among the scattered sheep. People may abandon God, but God does not abandon them. God will rescue us and bring back those who have strayed away (Luke 15:4). If you know someone in your life who have lost faith or is drifting away, do not worry. God is there with them and will bring them back. As shepherd of His flock, God knows His sheep (Jeremiah 1:5). He will judge between one sheep and another, as the reading says. We will get a better glimpse of what this means in the Gospel. The responsorial Psalm responds to the first reading of the Psalm that is probably the most known Psalm. It is often said during the mourning period after someone has passed away. God is our shepherd. He brings us to rest in green pastures and gives us water to refresh us. This is His grace which we receive in the Sacraments, when we pray and when we ask for specific graces to help us in our spiritual lives. God cares for us and protects us from those who hate us and want harm done to us (Exodus 14:14). We have in Jesus Christ the tangible God who is not distant. God is with us. We can visit Him in the Blessed Sacrament and spend time with Him. The second reading reminds us of Christ's role. He has died but has risen. Those who live in Him will also rise. To Christ, all authority has been given. Christ is the King. He is the king of life and even death because He has conquered it. Everything and everyone will be subject to Christ. Lastly, in the Gospel, we read of Jesus telling the disciples that He will come in glory with the angels and will sit on His throne. We are getting a glimpse of the last day or judgment day. Christ will separate the sheep from the goats or the good from the bad. Those who are on His right will go with God to heaven. Those who are on the left will be separated from His love in hell with Satan and his fallen minions. God will judge us based on the love we gave to Him and others. Did we help others? Did we feed the hungry? Did we give drink to those who thirst? Did we clothed the naked? Did we visit those in prison or the sick? Did we welcome strangers and help the poor? Were we merciful to others? God will ask us these kinds of questions. If we did do these things, then we did them for Christ. Christ is in the suffering person. This is why Saint Mother Teresa of Calcutta saw Jesus in the poor. She took today's Gospel to heart and lived it. That is why she is in heaven and is now a saint. If we have not done the things mentioned in the questions, then we will be in deep trouble and I mean deep! We will be condemned to hell. God is our Father. Like every parent, a mother and father wants their children to get along. Nothing is more disturbing in a family than sibling rivalry or family members who stop talking to each other. This is not what God wants. We must love one another. We must care for one another. We cannot be like Cain who refused to be his brother's keeper (Genesis 4:9). Since we are God's children, we must love each other and care for one another. Fights will happen. Arguments will happen. People disagree all the time. But this should not get to the point where hate takes over. We will be measured by the love we give to others (Luke 6:38). This is why Christ tells us to love our enemies and pray for those who hate us. We must do everything possible to keep peace and love as the norm. Unfortunately, we live in a world that praises revenge and discord. We fight with each other, sue each other, hate each other and so on. This is the sad reality of fallen human nature. Jesus can change that if we allow Him to do so. He is the King of the Universe and will be our judge. We do not want to be on the left side where He will tell us to depart from Him and will banish us to the pits of hell with the devil and his angels. We must be kind and loving. We must be merciful to others (Luke 6:36). As Catholics, we cannot see non-Catholics as our enemies. We cannot see gays, lesbians or transgender people as our enemies. We cannot see Muslims, Pagan, Hindus, Jews etc as our enemies. We cannot see fellow Catholics as our enemies just because they may disagree with us on something. These are all our brothers and sisters. These are the people we must feed, give drink to, clothe, visit etc. Let us help one another and care for one another as Christ wants (John 13:34). Christ is the King. He is our King. Let us make Him proud by doing good in this world. Laudetur Christus Rex! Please help me continue this ministry by donating on my Paypal or www.gofundme.com/sacerdotus. Your donations will help pay for domain names to keep the site up and running, podcast subscriptions and the purchase/mailing of sacramentals and other materials. Please consider becoming a patron or benefactor by donating on a monthly basis. God will reward you!